Content marketers want to be engaging influencers on Twitter. Their main goal is to create content that connects them with their target market. Sharing thought-provoking information on Twitter at the optimal times, with a clearly defined market, makes the foundation of successful content marketing. With the amount of time you must put into blog posts, newsletters, SEO, making videos or recording podcasts, you need to implement a consistent schedule for your tweets to develop your relations with your clients, generate new leads and increase sales. The benefits of using Twitter are huge if you use it the right way. Luckily, there are 3 simple and nifty tools that can help you do that. It’s a free Twitter tool that lets you know the best time to tweet. Quick, easy and painless. You sign in with your Twitter account and run a free analysis that generates a report which analyses your followers’ last 200 tweets and looks at when they tweet. When the report is ready, you get a self-sent DM with the link where you can access it. The time zone used to generate the report is the one you’ve set up in your Twitter profile. 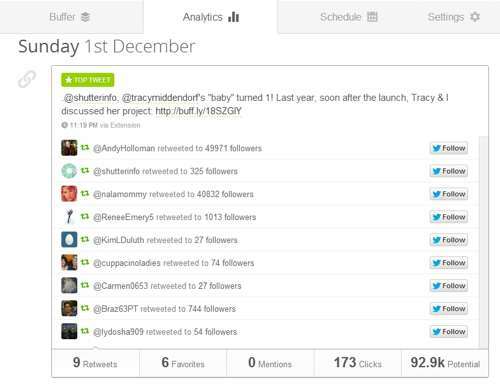 The free version shows when your tweets have the most exposure as well as when most of your followers are online. It’s broken down by weekends, Sundays, Mondays and weekdays. 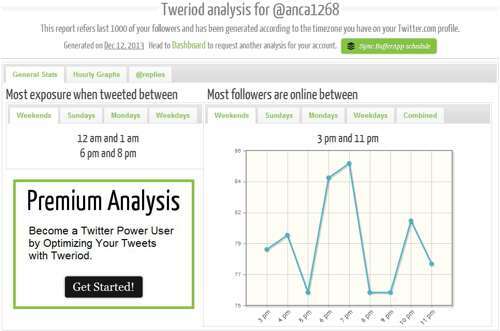 The free analysis is available through your Tweriod dashboard. You can always run a new one after one month. If you want to dig deeper, you can go for a premium analysis. Whether a regular or an adhoc one, there’s a number of benefits that you get. 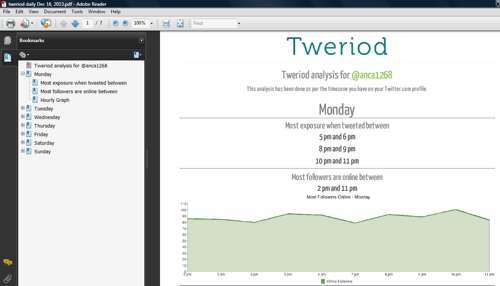 Tweriod analyses your past tweets and the ones of your followers, including detailed analytics of general, hourly and @replies stats for each day of the week. Plus, it auto syncs your Buffer account with Tweriod optimal timings. While you can view it on your dashboard, Tweriod will also put it in a neat PDF report that you can print out. Followerwonk offers a number of options from searching Twitter bios and finding people you’re after, to analyzing the users you follow and those that follow you, comparing, tracking or sorting them. 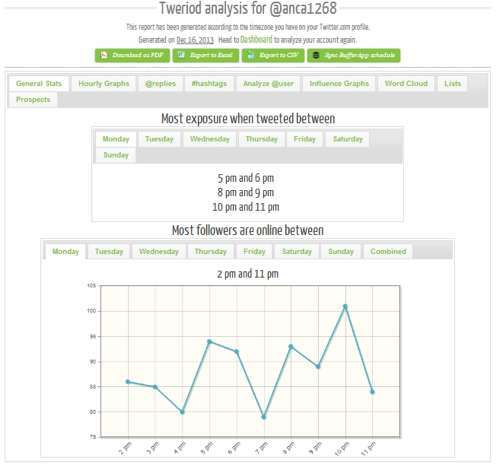 A simple and free feature is analyzing your followers to get an overview of when they are mostly active. Based on that graph, which you can easily save for your further reference, you can then import your optimal tweeting times to Buffer and consequently schedule your tweets. By comparison with Tweriod, Followerwonk looks also at off-hours; it assigns times to them less frequently which can be later fine tuned in the Buffer schedule. The beauty of Followerwonk’s integration with Buffer lies in the fact that it extends your tweets beyond your current followers to get more brand exposure, more leads and more sales. Followerswonk’s founder Peter Bray explained the process in a detailed analysis he carried out based on almost 5,000 active Twitter accounts. He found that nearly 60% of them retweeted someone they don’t follow, and looked at how much content penetration into new networks that means. Bray also pointed out the benefits of off-hour targeting, by analyzing a competitor on the other side of the world and looking at the active hours of their followers and reaching them with the right content. I used to test a few scheduling tools: from the defunct Twaitter, later renamed gremln, to Tweetdeck and Hootsuite. But once Buffer came along, I never looked back. Buffer offers an easy to use interface to automatically schedule and organically space out your social media updates over the day. With a short life span, a tweet is “consumed” in only 18 minutes unless it’s retweeted. Most RT’s are sent out within the first seven minutes. So how often should you tweet? According to wishpond, you would tweet more than six times a day. And since you can sync/import scheduling times from either Tweriod or Followerwonk into Buffer, this makes your life so much easier. Also, your followers will appreciate not having their timeline flooded with tons of your content, regardless of how good it is. 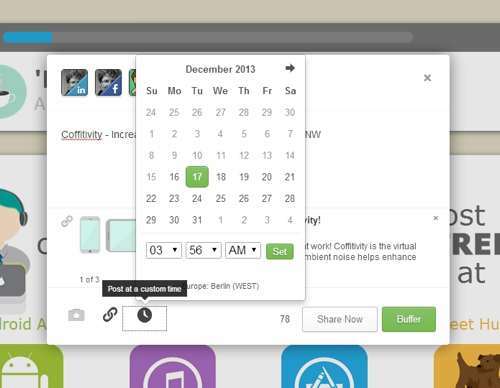 Once you install Buffer’s handy browser extension you’re good to go. You’ll also want to know how well your social media updates propagate on Twitter. Buffer is super straightforward and provides simple yet insightful analytics. A brief look into your Buffer analytics will show how many times your tweet was RTed, favorited, mentioned, including the number of recorded clicks on the URL you tweeted and potential exposure. Let’s not forget the option of custom scheduling. This comes in handy if you want to post something at a specific day and time whether you plan on launching an event or come across something you might want to share in between your already buffered tweets of the day. 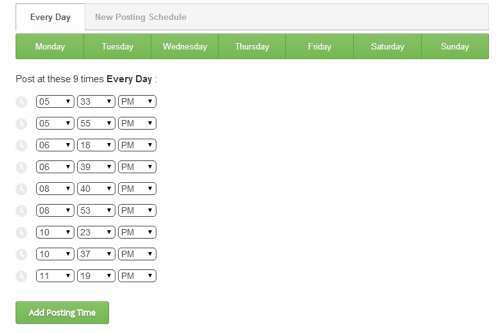 You’ll be able to distinguish between the two types of scheduled posts by a different marking in the interface. Custom scheduled ones show the time on a grey background. 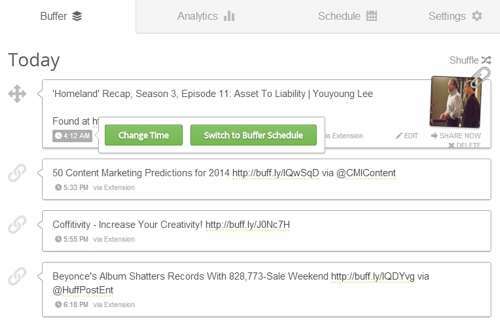 Note that shuffling your Buffer queue won’t move your custom scheduled posts. 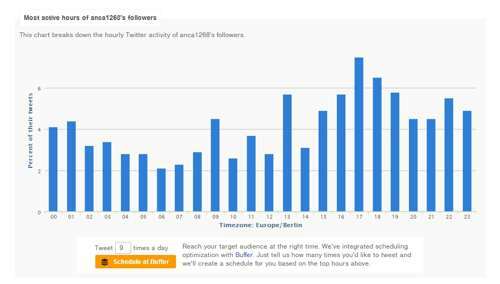 While this post looks at the scheduling options of a pure consumer or a small business for perfectly timing their tweets, more great news came out from Buffer’s camp with the launch of the new Buffer for Business aimed at small, medium and large companies. It keeps the same simple user interface but with more power added through detailed analytics, team collaboration and data exports. Having said that, as a basic rule, always be considerate with your followers and try to refrain from sharing content that’s only about you. Keep the right balance of the types of tweets you post: self-promotion, sharing and conversation. While self-promotion and sharing can be automated, make sure you take the time to be conversational too. At the end of the day, it’s all about making and keeping people happy with the best and perfectly timed content you can share, so they can always come back for more. UPDATE: There are some new tools out there. You may find this article useful on social media automation. Sound off your tips about smart scheduling your Twitter updates in the comments below! Anca Dumitru is a writer and content strategist. 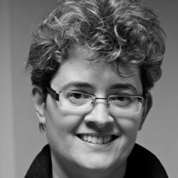 She helps businesses to get better results from their blogs and websites through content marketing, blogging and copywriting. Connect with her on Google+ and Twitter.